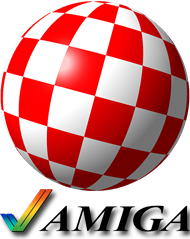 The AMIGA Boing Ball, was a mythical object in the computer industry created during a night at the 1984 CES by Dale Luck and R. J. Mical. This reworked 64-bit version is only 19 Kb in size including the icon resource. except that the multi-frame animation has been replaced by a real 3D object. It uses a popup transparent layered window to render the sphere animation with OpenGL. Not much to say about the C++ source code, that should be self explanatory for those familiar with the low level procedural SDK programming style. RenderAnimation is the masterpiece where the Amiga logo and the OpenGL 3D sphere are mixed together into the same DC using DrawAndSetupAlphaChannel. To stop the demo, catch the ball and press the ESCAPE key. Or shut it down from the task bar. The zip file attached to the first post has been updated, to better show the mixing of an image and 3D OpenGL altogether (see RenderAnimation).